The Arnolds hired William Lumpkins, a top architect in adobe construction, as well as a contractor from New Mexico. The Fort was first authentic replica of Bent’s Old Fort and while it was originally intended to be a family home, construction costs ultimately exceeded the budget. To offset additional costs, the Arnold family decided to turn the lower level of the historic adobe building into a restaurant, recruiting Taos artists to hand-carve the furniture, gates doors and chairs. 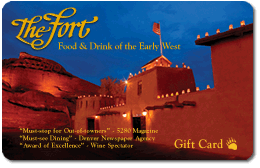 Since its doors opened in 1963, The Fort has served true New Foods of the Old West. A few months after opening the restaurant, the Arnold family rescued a Canadian black bear cub named Sissy, who lived at The Fort for 19 years. Sissy Bear, while the most famous of the Arnold family’s pets, was not alone. Many other animals resided here when the gates opened in the 1960s, including four German Shepherds, an oversized tom cat, pet rabbits and even a skunk. Over the course of 55 years, The Fort has served many presidents and celebrities, including Bill Clinton and Julia Child; received many awards, including Wine Spectator’s Award of Excellence and being named one of OpenTable’s Most Scenic Restaurants; and carried on many traditions, including the firing of our canon on the Fourth of July and New Year’s Eve. Holly Arnold Kinney, daughter of Sam’l and Bay, originally chose to pursue a career in advertising and public relations. In 1999, Kinney joined her father in business and purchased 49% of operating business at The Fort, while simultaneously operating her own agency, Arnold Media Services. Kinney eventually left the agency world in 2001, and later became sole owner of the legendary restaurant following her father’s passing in 2006. While the Colorado restaurant scene continues to change, Kinney works hard to maintain The Fort’s legacy. In 1999, Kinney, Sam’l Arnold and Mary Fox founded the Tesoro Cultural Center, a non-profit dedicated to protect and make available the artistic treasures of our American past, including Colorado’s rich history and shared experiences with diverse cultures. Kinney was inspired to start the non-profit as a way to build the legacy of The Fort into a living, interactive history museum. Kinney has served as Executive Director of Tesoro since 1999, and is responsible for creating all primary educational programs, including the annual Indian Market and Powwow, school tours and more. Kinney was recently recognized for her numerous contributions to Colorado, its tourism industry and the restaurant landscape as a whole; she received the Outstanding Women in Business award for the Mile High Leaders category by the Denver Business Journal and was inducted in to the Colorado Visit Denver Tourism Hall of Fame in 2017. Working daily on-site at The Fort, Kinney works closely with The Fort’s Executive Chef to develop and introduce new menu items, while staying true to the menu’s historic roots. She pulls inspiration from her 3,000-volume rare and historic cookbook library, which details the cuisine of pioneers along the Santa Fe Trail, mountain men and American Indian tribes. Many of The Fort’s original menu items can still be found on the menu today. The next time you dine with us, look for Sissy Bear’s paw stamped next to menu items, representing original dishes from 1963. These items include the Bowl of the Wife of Kit Carson, our famous Negrita dessert, the historic 1840 Hailstorm Premiere Julep and more. No matter how many years go by, one thing will always remain the same: Our guests are the most important and valuable piece of our business. As you dine with us and help us celebrate our 55-year anniversary, we invite you to share your favorite memories with our staff. We appreciate your continued support and hope you will join us for shinin’ times at The Fort soon.